Any creation proceeds from a formative, pre-determined 'idea'. The artist creates a work of art that originates in some creative idea. It is therefore perfectly logical to presume that the creation of the universe, the creation of the world of multiplicity must also originate from some ‘Master-Idea’ in the mind of some ‘MASTER-ARTIST’. That Master-Artist or Master-Creator is called ‘God’ in ordinary parlance. The problem is that the human mind with its limitations cannot fathom the depth and range of the creator’s Mind and creates ‘God’ in the image of a magnified Man, who is the culmination of all our highest possibilities and potentialities. 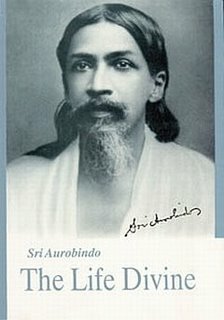 Sri Aurobindo conceives that the phenomenon of 'creation emanates from the creative Consciousness of the 'SUPERMIND'. 1. The equal, pervasive consciousness of the comprehensive Supermind must shift to an unequal concentration of consciousness (Ibid, pg 152). The unequal concentration gives rise to ‘the beginning of self-division,-- or of its phenomenal appearance’ (Ibid, pg151).This is necessary, as creation is comprised of forms that are variegated and not monotonously same. After all, we have to explain a world that spans from the inanimate to the animate, from the saint to the sinner. This shift from an equal to an unequal status is a shift from the spaceless to spatial reality. 2. The unitary consciousness of the Comprehensive Supermind that no multiplicity can efface must shift to a multiple distribution of Force (Ibid, pg152-153). Force or Shakti is implicit in Consciousness and is necessary to execute an idea to its fruition. After all, we have to explain the variety, range and depth of the 'Force' in creation – that spans from nuclear energy in material substance to the life-energy in biological substance and will-power in psychological substance. As distribution of Force means 'movement' of force, this shift from the poise of unity to multiplicity is actually a shift from the 'timeless' to 'temporal' reality. The Apprehending Principle of the Supermind provides the metapsychological basis of the 'personal' God. ORIGIN OF SPATIAL FROM NON-SPATIAL REALITY. 'Space' alone cannot create a world of forms. 'Forms' created cannot remain in isolation to constitute a world of multiplicity; they have to construct a harmony between themselves. This harmony cannot be a ‘static’ affair- it must be dynamic and progressive. This automatically means that the divisibly of space must be complemented by successions in Time, the ‘stable’ extension of consciousness must be complemented by a simultaneous 'mobile' extension. ORIGIN OF TEMPORAL FROM NON-TEMPORAL REALITY. The non-temporal reality is also the unitary, primal consciousness where creation has not been initiated. The moment creation is initiated and a world of forms manifest in divisible space, it becomes imperative that that there should be a regulated interaction between different forms so that a harmony is established. Harmony itself is a phenomenon that cannot remain static for as forms ‘evolve’; harmony has also to get upgraded in higher poises. This requires movement, progression, and ascension. This becomes possible only when there is a multiple distribution of the Force or Shakti inherent in the primal consciousness (the ‘Consciousness- Force’ or ‘Chit – Shakti). Movement or Progression is measured as successions of Time. TIME IS THUS A SUBJECTIVE EXTENSION OF CONSCIOUSNESS. It is ‘a MOBILE extension measured out by the succession of the past, present and future in which Mind places itself at a certain standpoint whence it looks before and after’ (Ibid, pg 144-145). 'Conscious Force' as Space and Time.